M-INT Kobe, a commercial complex scheduled to open in Kobe on October 4, has been outfitted with an exterior lighting system that translates cosmic energy waves into pulsating blue light. 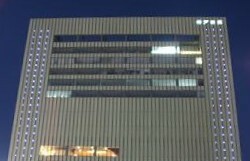 The system is the first of its kind to be installed on a building in Japan. Called "Super Nova," the lighting system consists of 2,880 blue LEDs arranged in two columns spanning the height of the 18-story building's west wall. The embedded lights are activated by sensors that detect cosmic rays. According to Takuro Osaka, the University of Tsukuba Graduate School professor who designed the system, the brightness of the blue lights fluctuates according to the intensity of the detected cosmic rays, giving the building an ever-changing magical glow. Takuro Osaka has been exploring the use of cosmic radiation in art since 1995, and for years he has been discussing the possibility of collaborating with Japan's space agency (JAXA, formerly NASDA) on art projects in outer space. Check out Takuro Osaka's homepage for details about his previous spaced-out projects.